Is the idea of soul sleep, that when we die we are unconscious in the grave until we are resurrected, biblical? I grew up under the teaching of many churches and even Bible college professors that when we die we will lie comatose in the grave along with our decaying corpse waiting for Jesus to return and resurrect us. The more I read the Bible, though, even with its many references to sleeping in the earth, the more I realized that the concept of soul sleep just didn't jive with much of what the rest of what the bible taught concerning the destination of our souls upon death. How could so many Christians even be so confused about this concept? 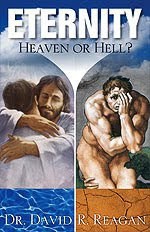 Dr. David Reagan in his newest book, Eternity: Heaven or Hell?, studied in-depth the concept of what happens to the soul upon death. I recently interviewed Dr. Reagan to find out what he plumbed from the depths of the Bible to answer this vital question. Here now is the second question in this interview series concerning what to expect in the afterlife. Dr. Reagan: I think this is one of the most popular misconceptions about what happens after you die. I grew up in a church that also taught soul sleep. Soul sleep is the teaching that when you die you lose all consciousness. You lie in a grave comatose for eons of time until the Lord comes back. Then you are resurrected and you regain consciousness. There is a biblical basis for believing in soul sleep and that is the fact that the Bible often refers to death as sleep. But, it is doing so figuratively, and we can prove that beyond a shadow of a doubt. The reason that it uses that figurative term is because when you die your body does go into a grave, but your soul, your spirit, goes to be with the Lord. So, the body figuratively sleeps in the sense that the body goes into the grave. The body is lying there in the grave and one day that body is going to be reanimated, because when the Lord comes back and the Resurrection occurs that body whether it has been eaten by the worms, whether it has dissolved in the ocean, or whatever, the Lord is going to speak. There is going to be a great miracle of recreation in which that body will come back together and He will put your spirit back in your body and you will receive a glorified body at that point. So, there is just no such thing as soul sleep. You do not lose consciousness. Your spirit goes to be with the Lord. Paul emphasized that in his writings. In 2 Corinthians 5:8 he made the comment that, "I would rather be absent from the body and be at home with the Lord." He had no idea of lying comatose in a grave. Not to be here was to be with the Lord. Over in Philippians 1:21, Paul says, "To live is Christ," to serve the Lord, "but to die is gain." Well, certainly, it is not gain to lie in a grave comatose. It is gain because that is to be with the Lord. Paul also says in Philippians 1:23 something along the lines of: "I am kind of hard pressed in both directions. I have the desire to depart and be with Christ, but I also want to serve him. So, I will serve Him as long as He wants to, but I really would prefer to go on and die and be with Him." There's no concept of lying comatose in a grave. Not to be here was to be with the Lord. Nathan Jones: Okay. That makes perfect sense. The body is what's "asleep" in the grave, but the soul is with the Lord. Read on for an answer to Question #3 on the unbeliever's destination! 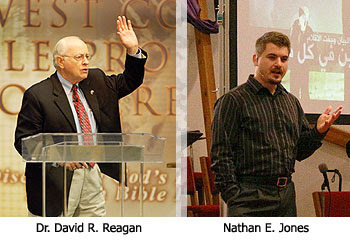 In addition, Dr. Reagan deals with questions pertaining to salvation: Are there many roads to God? Can salvation be earned through good works? Can salvation be lost? He also takes an in-depth look at the resurrection of Jesus, examining the evidence for it and discussing its essentiality to the Christian faith. Order your copy for $15 today! I'm not a Biblical expert but every transaltion I've read says "TODAY you will be with me in paradise." and dont forget the souls of those "slain for the words of their testimonies" in rev 6:9-10 who cried out with a loud voice "how long..."
And don't forget while your body is laying in the grave, the graveclothes will rot away leaving you completely naked at resurrection for the white throne judgement. Unless you are resurrected at the rapture and receive wedding clothes (white linen). Imagine the horor! I had never thought about this until I saw the cover of this fantastic new book. I have not been able to get the picture out of my mind or heart. May The LORD use this book to save the lost and strengthen the witness of His saints. Thanks so much for clearing up this confusion, Nathan. That's one of the oddest things I've read. Who would ever think of such a thing? Odd. But what about people that die shortly before the white throne judgement? Their clothes wouldn't have had time to rot. That's just an odd concept. Why go there? Did I mention this is odd? Being dead must be a bit like being asleep and dreaming. The body is at rest but the mind and the spirit still functions. Whether it's soul sleep or going instantly into the presence of God, after death, next thing believers will be aware of is meeting the Lord face to face. In my opinion, your belief about this (one way or the other) doesn't really affect anything (unless it's to be "right" when it's all said and done)! where is there any mention of an "immortal soul" in the Bible? does man possess immortality apart from Christ? was Adam and Eves immortality conditional? is there any mention of an "eternal soul" here God said "from dust thou came and unto dust thou shall return"